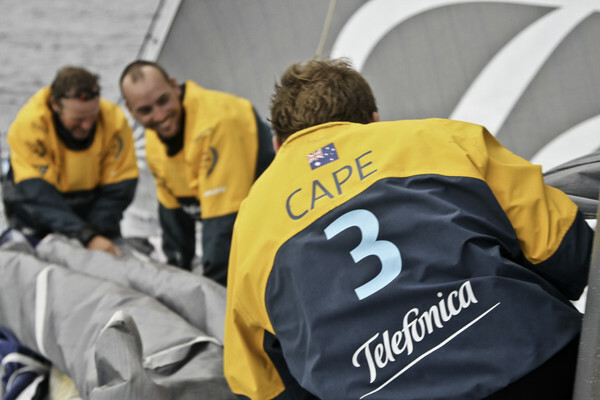 Team Telefónica were surging towards the Leg 1 finish line in Cape Town on Friday, poised to secure victory and move from last to first on the Volvo Ocean Race leaderboard. 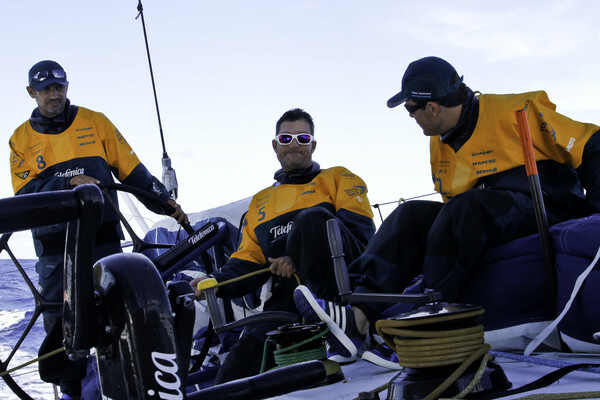 Iker Martínez’s team, who finished last in the Alicante In-Port Race, are clear of closest rivals CAMPER with Emirates Team New Zealand and have less than 500nm of straight line sailing to go, across a course filled with wind that could increase to more than 25 knots. The latest ETA has them completing the 39,000nm first leg as early as Saturday afternoon but the team will not be completely confident until they can see Table Mountain and then hear the sound of the finish gun firing. “Even though the forecast is good and everything looks really great, anything can happen out here,’’ navigator Andrew Cape said from sea. Cape put the team’s performance down to good decision-making and clockwork crew-work. “It’s hard to put your finger on one thing, but it comes down to solid decision making, that helps,’’ he said. “We were always pretty sure of where we wanted to go, that’s just my aspect of it. Team Telefónica are expected to cross the finish line at approximately 1520 UTC on Saturday, having stretched their lead over second placed CAMPER. 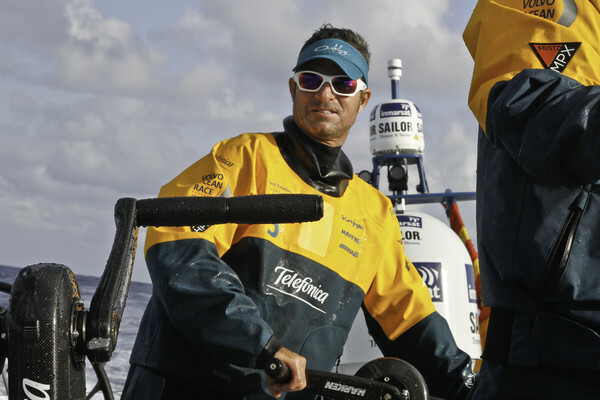 Volvo meteorologist Gonzalo Infante said there was a chance that the Spaniards would increase their current lead of 130 nm to more than 230 nm, because their south-east positioning gave them greater wind and a better angle on the runway to the end. If current standings are maintained across the finish line, Telefónica will have 30 points for first place in the offshore leg to add to the single point they got for last place in the in-port race in Alicante. CAMPER will secure second position in Leg 1 and on the leaderboard, trailing Telefónica with 29 points. CAMPER are expected to finish about 12 hours after Telefónica, crossing the line at around 0300 UTC on Sunday morning. On board CAMPER co-skipper Stu Bannatyne said Leg 1 had proven that all of the pre-race speculation that this would be one of the closest Volvo Ocean Races in history was correct. In third position, Groupama sailing team continue to pay for choosing the southern route down South Africa’s coast while the rest of the fleet raced to the west in the first days of Leg 1. The French team will have a much tougher route to the finish, including gruelling upwind conditions in their final days. They are expected to finish Monday evening or Tuesday morning approximately. Third place would see them up to third on the leaderboard with a total of 22 points. Back on land, Abu Dhabi Ocean Racing skipper Ian Walker is expected to arrive in Cape Town on Saturday to reassemble his team and his boat Azzam. Walker said he expected the new rig to be ready to sail two or three days before the In-Port Race on December 10. Team Sanya skipper Mike Sanderson admitted that his team were on an extremely tight timeline to repair the boat’s broken bow. However, he said he was “very confident” his team would also be ready to compete in the In-Port Race. 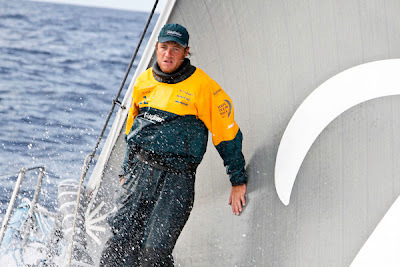 PUMA Ocean Racing powered by BERG continues to motor towards Tristan da Cunha, and are expected to arrive in 24 hours, while the ship that will pick them up was due to leave South Africa for the remote island today.